For many network engineers, IP multicast routing is evil. Difficult to design, complicated to implement, painful to troubleshoot and challenging to scale, multicast routing is rarely implemented on a given network unless it’s absolutely required. Most engineers would just rather not bother until the issue is forced upon them. Blame PIM. Blame RPF checks. Blame redundant rendezvous points. Blame inscrutable mroute tables. Blame whatever you like, but then realize that more and more often, multicast routing is as an actual need for production networks. Take VXLAN – it needs multicast routing, at least when implemented according to the spec. Or Cisco’s OTV – in its first iteration, it required multicast routing. And of course, there are lots and lots of applications that require multicast routing so that destinations can receive multicast streams from hops-away sources. Legitimate use cases haven’t made multicast routing any less of a pain in the backside to implement, and Avaya has put together an interesting solution to address this concern. 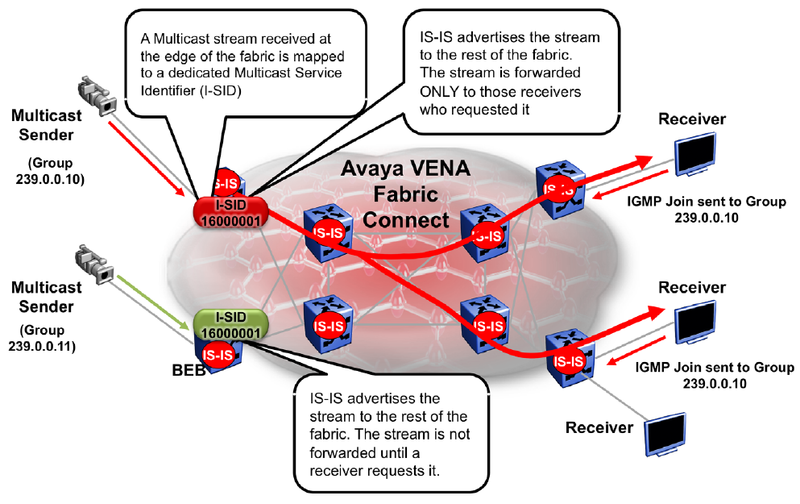 With Fabric Connect (Avaya’s SPB implementation), deploying multicast routing is a whole lot simpler than what network engineers are used to. Chief Architect for Avaya Networking Paul Unbehagen and Darren Giacomini, Network Architect for Schneider Electric’s Pelco division, join the Packet Pushers to talk through how multicast routing over Fabric Connect works. Paul is a big part of the standardization process for SPB – he knows SPB inside and out. Darren is an Avaya customer who uses Fabric Connect to scale massive multicast IP surveillance networks. Yeah, it’s an Avaya-sponsored podcast, but it’s not simply marketing blah-blah. This is a technical conversation with two people very close to the technology. We keep it nerdy. You’ll learn something about multicast routing, and you’ll learn something about shortest path bridging.